I still remember when I first saw VBA some 4 years ago. I was already an experienced Excel user, and I really felt strange – I thought that I was losing so many hours and days with things that I could have done within seconds. 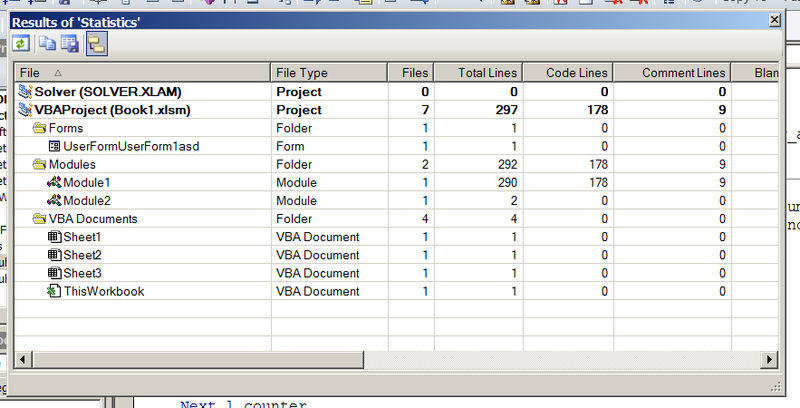 Thus, I have started learning VBA. Then, I have stated learning C#. And I saw Visual Studio with its outstanding capabilities (compared to the VBE it is like a starship to a carriage). Then I started to look for programming jobs with VBA and at my first successful one I was working with a guy, who showed me MZ-Tools. He was using it a lot and as far as we were working together, I started using it as well and since then I am using it on a daily basis. Thus, I was really thrilled when I saw a new version of the tools in the mztools.com web site. I have kindly asked the owner of the tool to review it and Mr. Carlos Quintero kindly responded to my request. Thus, the review of the MZ-Tools for VBA starts now. You probably remember some of the options of the older version of MZ-Tools. But the news are here as well. The first thing that I have seen was the “Clear Immediate Window” option. It is rather useful, and a nice one, as far as VBE does not have shortcut for that and you have to do it on you own with either using SENDKEYS or manually (or not clearing it all). Imagine that you have added a nice onclick event on one button on a form and now you want to put it on another. Before, you should have copied the control and then copy its code. Now the clicks and the efforts are less. If you are new in Excel VBA, this is something that would help you tremendously. 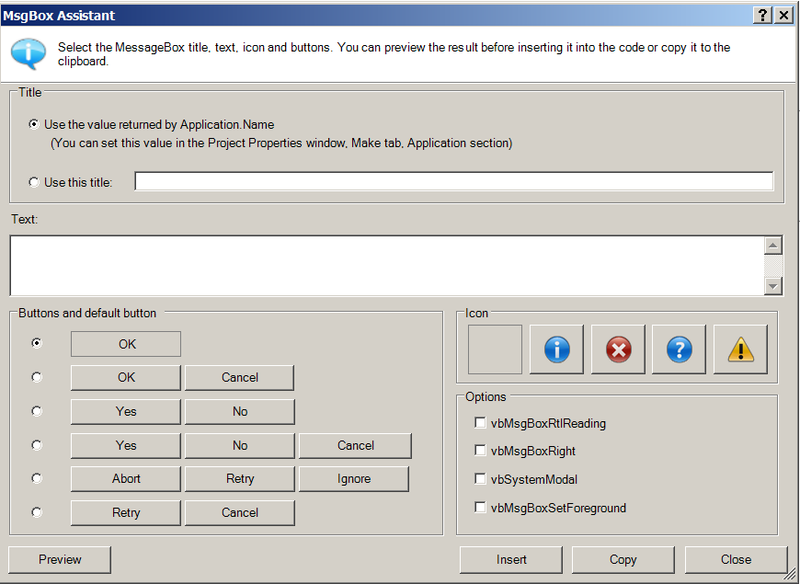 Configure your msgbox and see it in the preview. You would get the code generated, ready for you to write on it and avoiding that you make an error. 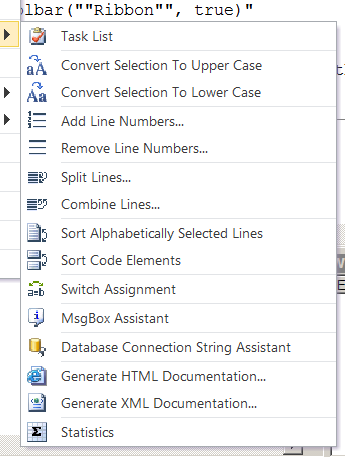 The easy generation of Documentation and the Connection string assistant are useful, if you need them. They are available from “Other Utility” submenu of the main menu. Let me put it this way – the automatization of easy error handler insert has probably saved plenty of programming time, even if we consider that this is just pasting the code. Really, the first time I saw it, I was really happy. Yeah. And on the picture here, you may see the “Insert Code Element Headers” button. It goes through every procedure or function of your module and inserts header. Useful, if you need to have your project look beautiful. Finally! Something that would improve the quality of your code. This is what the small teams of two-three devs were waiting for. 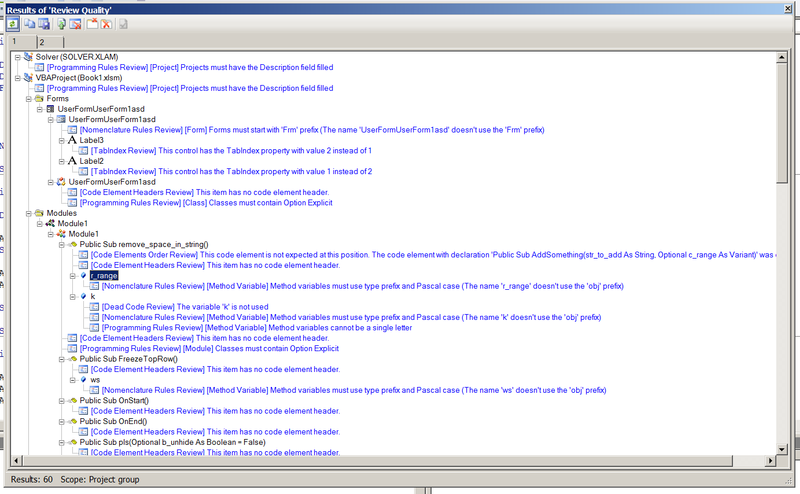 Take a look at the screenshot below and see how many styling errors it can get. Also, you may choose which styling errors to look for. Favourite pieces of code – these are easily added and easily inserted into the code. Sorting procedures – you may choose which sub goes first, which goes second, which goes third. An improve search option, with more possibilities than the standard in the VBE. 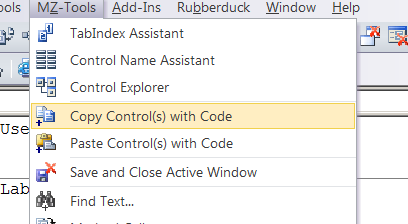 The MZ-Tools is also integrated for Visual Studio VB and you do not need to install it separately there. Pretty much that is my review. 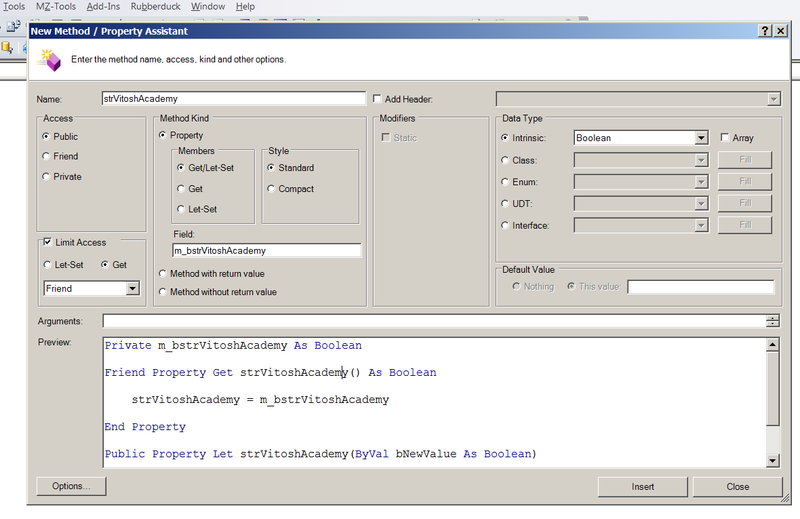 If you are working as a VBA dev., you are aware that MZ-Tools is a must have. A simple search in stackoverflow for “MZ Tools” returns 158 topics. So, I am not going to advertise it for you. Just telling what is inside and what can you expect. There is a 30 days fully functional trial version, so you may decide for yourself.